We live on a 10 acre property at the end of Moggill Rd, Moggill, which is an outer suburb of Brisbane, Australia. The western boundary of the property is the Brisbane River. The property is a haven for native plants and animals. In the years we have owned this property (since 2003) its landscape has shifted dramatically from a long-ago dairy farm. A track for the cows is still evident across the side paddock into a neighbouring property on the north side. Two very old large figs on our property may very well have provided shade for cows during the milking process which occurred on the property to the south. Previous owners established a fenced home enclosure with a long driveway from the road. They fenced off a front and side paddock for horses. The side paddock fence extended in a dog leg to take in the whole river frontage of about 300m. Now there are still horses in the front paddock but we have taken the building blocks of our home enclosure, side paddock and river frontage to develop native habitat. Some parts have been converted to native bush, some parts are gardens that predominantly contain native flora and other parts provide organic food. At some stage a prior owner took up the theme of figs and planted a significant number of different varieties of fig. We have continued this theme by planting dozens of figs that are native to this area, especially in the time since the rainfall resumed more normal levels at the end of 2009 and after the 2011 flood. There are about 12 magnificent gums – Eucalyptus tereticornis – along the riverbank as well as smaller ones in the paddocks. 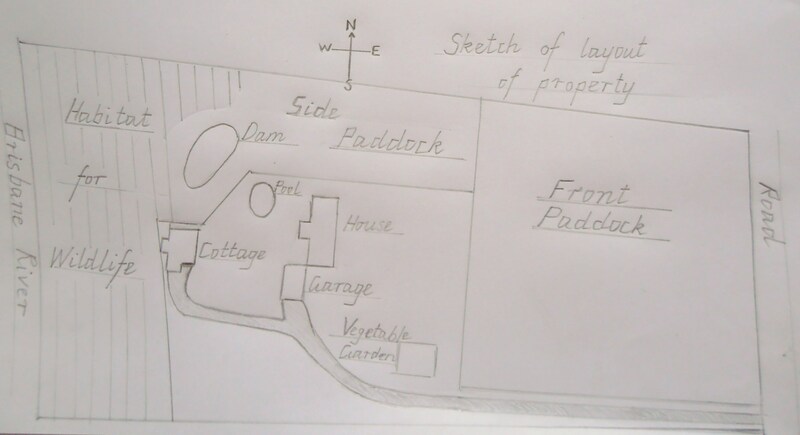 There is the outline of a small orchard established by another previous owner which we have enlarged as well as installing a chook house and vegetable garden, with herbs in one garden near the home. As well as definitive Australian flora such as wattles, grevillea, callistemons, melaleucas …that we have planted, there are some non-native specimen trees planted by earlier owners e.g. leopard trees, jacarandas, poincianas … We have also cultivated some non-native trees e.g. oaks, frangipani. There are about 10 mulched garden beds which predominantly contain natives however around the house some colourful non-native flowers are included. Some of the older gardens now form a bushland atmosphere with layers of leaf litter, broken branches and different sized plants – the taller trees providing a canopy for smaller trees and bushes. The riverbanks and gullies have been re-vegetated with native shrubs and trees. These areas constitute the biggest challenge with the continual resurgence of riparian weeds, in particular 3 persistent vines – glycine, asparagus fern and balloon vine. Google Earth provided the aerial photo of our property. Ian/Janet….love the blog. 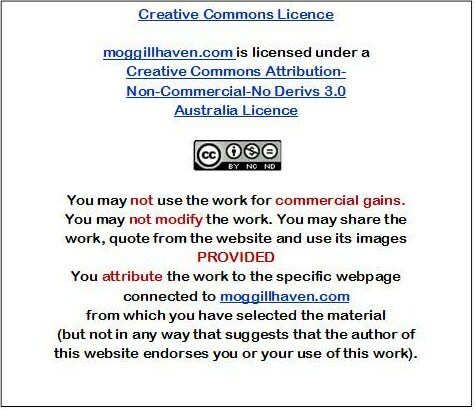 We can now follow your progress in your endeavours to return Moggill back to native Australia.